Ketotifen is a relatively selective, non-competitive histamine antagonist (H1-receptor) and mast cell stabilizer. Ketotifen inhibits the release of mediators from cells involved in hypersensitivity reactions. Decreased chemotaxis and activation of eosinophils has also been demonstrated. 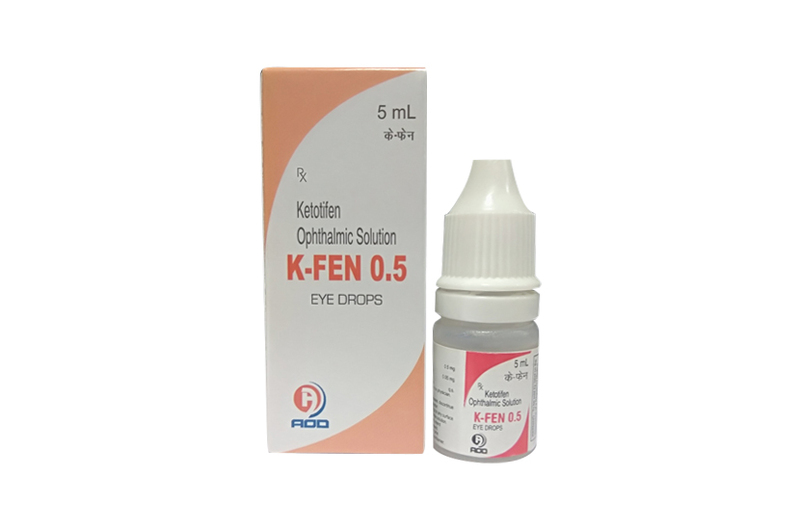 K-FEN 0.5 (ketotifen fumarate ophthalmic solution) is indicated for the temporary prevention of itching of the eye due to allergic conjunctivitis. K-FEN 0.5 is contraindicated in persons with a known hypersensitivity to any component of this product. The recommended dose is one drop in the affected eye(s) every 8 to 12 hours. K-FEN 0.5 is supplied in one Clear Polethylene Bottle packed with printed labelled & cartons And Such 25 Carton Packed in a Shrink Sleeves & corrugated box.